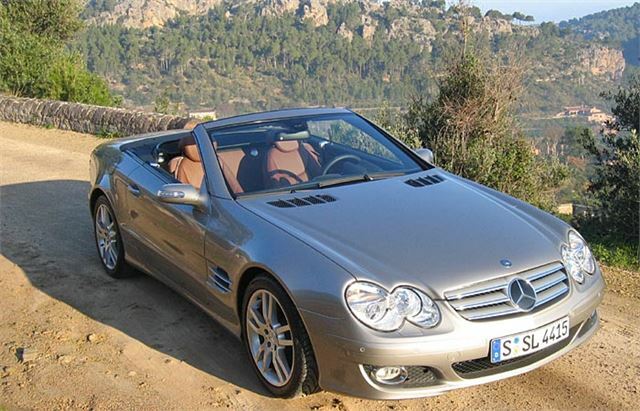 In early 2006 the R230 Mercedes SL range was significantly revamped. 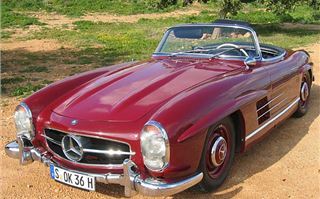 The cars still looked the same, but under the skin were new engines and transmissions in the SL350 and SL500 that transformed the cars. That hasn’t changed. The range has expanded up and down. 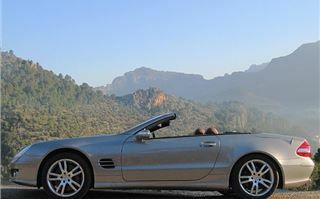 You can now have a relatively fuel efficient £63,000 3.5 litre SL350 with 272bhp and 350 Nm torque. This is slightly better in all respects than the old 3.7 litre SL350. 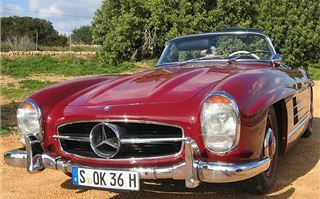 You can go one better with the new £75,880 5.5 litre 388bhp 500SL. Or you can go completely Puerto Banus with a £149,000 SL65 AMG that boasts 612bhp, 1,000Nm torque and a de-restricted top speed well over 200mph. Over the last year UK registrations have split 65.4% SL350, 23.2% SL500, 0.8% SL600, 9.1% SL55 AMG, while 1.5% cough up the extra £49,000 for an SL65 AMG. People will know you have the latest model from the slightly cleaner styling with a more pronounced V shape bumper, three large air intakes, chrome fog light surrounds, new alloy wheel designs and new rear light lenses. Inside, you’ll be marginally more comfortable in softer, more supple leather, with a nicer double-top-stitched instrument shroud. And the state of the art solid roof still opens or closes in 16 seconds. Interestingly, the torsional rigidity of the car increases from 17,000Nm per degree with the top down to 21,000Nm per degree with the top up. At the launch we were slightly nonplussed but pleasantly surprised to be presented with Mercedes heritage fleet of older SLs, dating back to the 1950s. The idea was we would drive these first, and the reason soon became apparent. 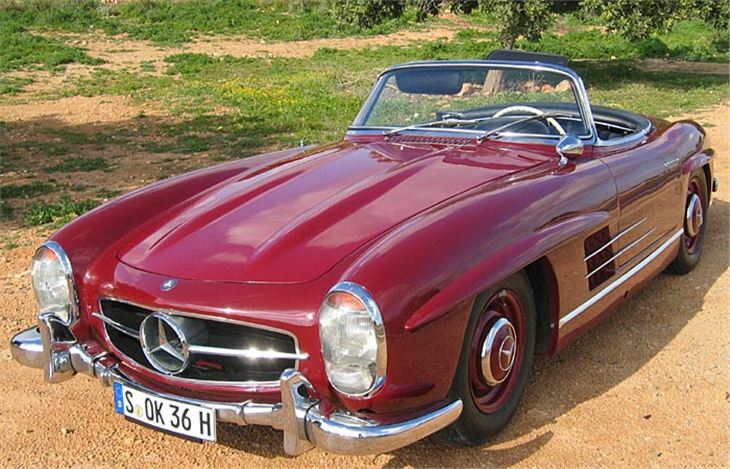 The 1961 300SL we drove would still pull an indicated 125mph, no bother, though the speedo had a mind of its own. It was fast, handled decently and sounded glorious. Which is the main difference between the revised SL and the original 2002 SLs. Next, I took out a new SL350 fitted with a couple of important optional extras: 7G-TRONIC Sport that is a programmed to change faster than the standard 7G-TRONIC and has the benefit of steering wheel paddleshifters. And ABC Active Body Control (standard on the SL500), which allows you to select stiffer suspension settings if you really want to motor. It also has slightly quicker steering now 2.5 turns lock to lock rather than 2.6 and a much more precise ‘feel’ than before. 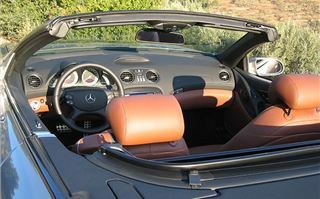 Pull the left hand paddle to change down, floor the accelerator and the banshee wail of the exhaust immediately tells you what Mercedes has changed. They’ve taken a good car at its best cruising and posing. And, without sacrificing its cruising ability, they’ve turned it into a sportscar. The extra power helps, of course. Getting on for as much as the 306bhp of the original SL500. But that was a lazy engine, and this one isn’t. It relishes high revs and can provide as much fun as you ever really want. Yet the other side of its split personality remains the “look at me” boulevard cruiser that made the SL the World’s most desirable 2-seater. 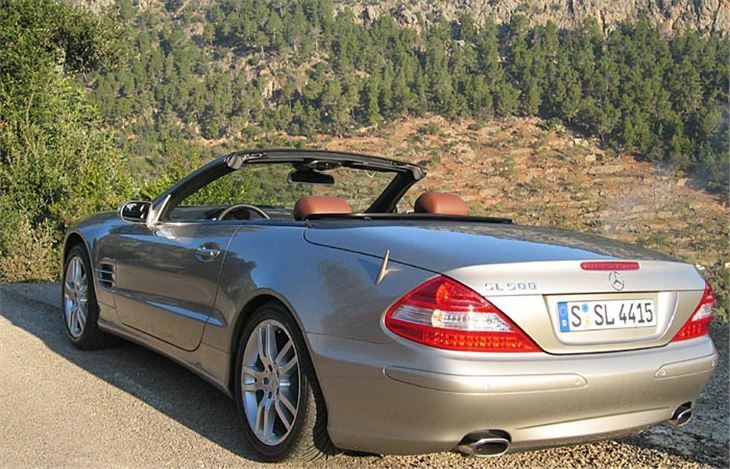 You might, therefore, wonder if there’s any point in stepping up to the new SL500. 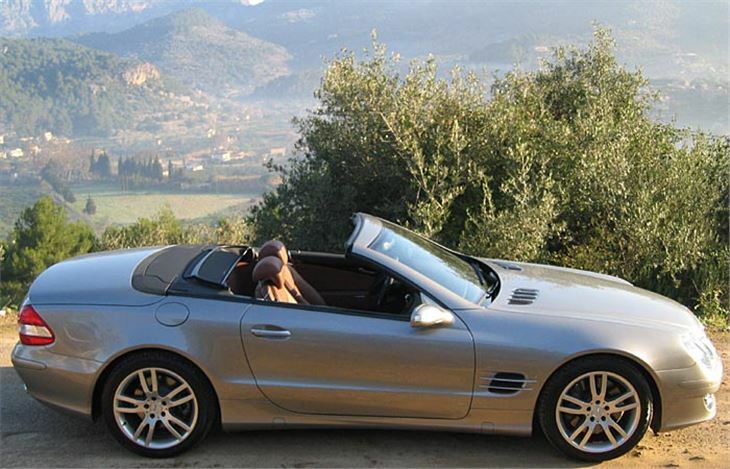 Well, an extra 116bhp and a full 82Nm more than the old SL500 is a very good reason. This car really does have as much power as any of us could sensibly want. Whack it down a couple of ratios, floor the throttle and it takes off so quickly and positively you pass 6 cars in the time it might normally take you to pass one. Excellent braking reins it in even faster. So while it might not go, stop and handle quite the same as 911, it ‘s easily as much of a sportscar as most of us can actually cope with. It also howls, rather than wails, with a more pleasing exhaust note than a Ferrari 430. Yet if all you want to do is cruise, it still does that as well as the 2002 SL500. Its only true competitor is the new Jaguar XK8 convertible, which is also a lot sportier than the old one. 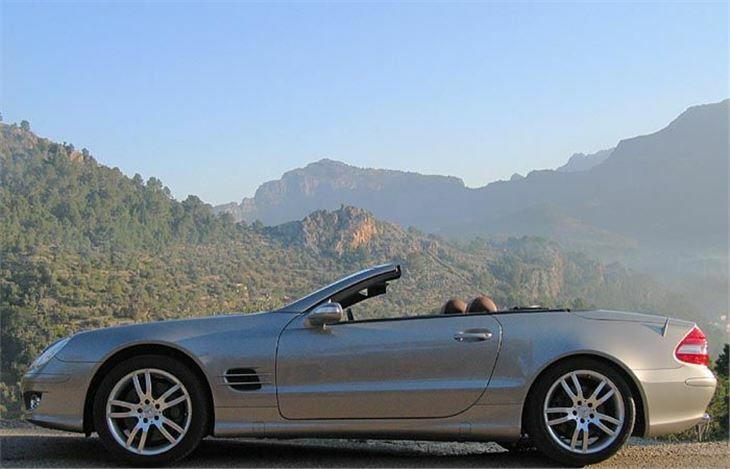 The new SL500 takes the wind out of the sales of the 517bhp SL55 AMG. That’s still a lot faster, of course. But whereas previously if you wanted a fast, sporty SL the 55AMG was the only choice, now the new SL is as much as many people are going to want. The 517bhp SL600 remains sheer one upmanship an the 612bhp SL65 AMG tells everyone you can not only afford the best, but also the best of the best. But with the speed restrictor holding these cars back to 156mph all you gain are seconds saved in acceleration that could just as easily get you into serious trouble with a wall or crash barrier. Up to you, though. If you can afford it and you want it, Mercedes Benz makes it for you. For the rest of us, the SL500 is plenty enough to aspire to, and, with the possibility of 27mpg combined, the SL350 is even moderately sensible. Those two are the real life choices, and the choices most rich Brits are most likely to make.